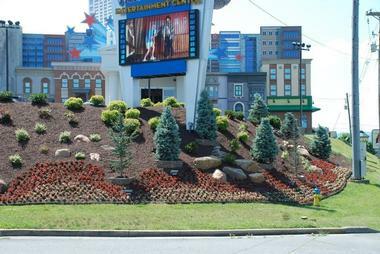 Pigeon Forge is a charming town surrounded by the Great Smoky Mountains in eastern Tennessee. The town is home to Dolly Parton's Dollywood family amusement park and the Titanic Museum built in the shape of the original Titanic ship. 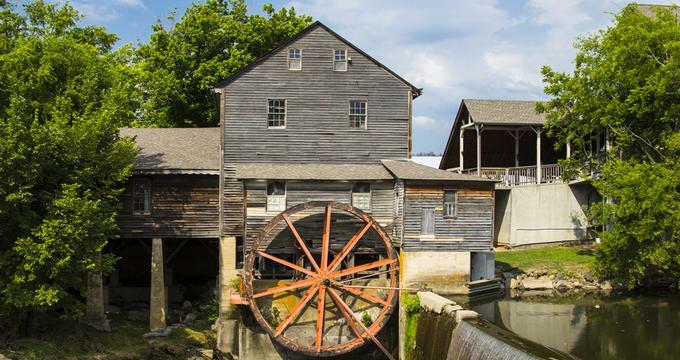 Stroll through the Old Mill Square where you can see a water-powered gristmill built in 1836, visit the largest Hollywood Wax Museum in the United States, and see Elvis Presley memorabilia at the Elvis Presley Museum. Here are the best things to do in Pigeon Forge, TN. Dollywood is a theme park located on Dollywood Parks Boulevard and one of the top Pigeon Forge TN attractions. Owned by Dolly Parton and Herschend Family Entertainment, Dollywood is one of the most popular tourist attractions in Tennessee. This theme park features amusement rides, Chasing Rainbows Museum, as well as music and traditional crafts that represent the local Smoky Mountains region. Dollywood hosts many concerts and musical events including performances by Dolly Parton, her family, and local and national musical entertainers. Dollywood is also the home of the Southern Gospel Museum and Hall of Fame, and is one of the best things to do in Pigeon Forge. In addition to Dollywood, the 295-acre amusement resort includes the Dolly Parton’s Dixie Stampede Dinner Attraction, Dollywood’s DreamMore Resort, and Dollywood’s Splash Country water park. The Old Mill Square is a complex of shops and restaurants located on Old Mill Avenue. 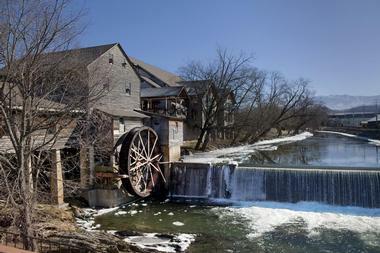 It includes a water-powered gristmill built in 1836 on the banks of the Pigeon River in the Great Smoky Mountains. Over the years, the mill has been used to grind flour and meal. Later, it was used as a gathering place for locals, a place to house wounded soldiers during the Civil War, and a source of electricity. Today, it still functions as a mill and is listed on the U.S. National Register of Historic Places. If you are wondering what to do in Pigeon Forge today, this is a great place to start exploring. The Old Mill Square is home to the Old Mill General Store, two restaurants, a pottery shop, a jewelry shop, and much more. Located on Showplace Boulevard, the Hollywood Wax Museum is dedicated to exhibiting celebrity figures. Opened in 2012, it is the largest Hollywood Wax Museum in the United States and one of the best things to do in Pigeon Forge, Tennessee. There are two floors of wax figures from the U.S. film industry and the Hollywood entertainment business. Some of the celebrities from the past include Charlie Chaplin, Marilyn Monroe, Elvis Presley, and John Wayne, among others. Today’s celebrities include stars such as Bradley Cooper, Johnny Depp, Robert Downey, Jr., Julia Roberts, and more. Visitors also learn interesting facts about the celebrities. In addition to seeing the figures, visitors are able to pose for photos with their favorite stars. Located on Parkway in Pigeon Forge, the Titanic Museum is built in the shape of the original Titanic ship. Opened in 2010, four years after its sister attraction in Branson, Missouri, it is a two-story museum that was built half-scale to the original ship and is the world’s largest permanent Titanic museum. The museum sits in a pool of water that mimics the original ship on the ocean. There is a two-hour self-guided tour in which guests can visit the museum’s 20 galleries and see its 400 pre-discovery artifacts. 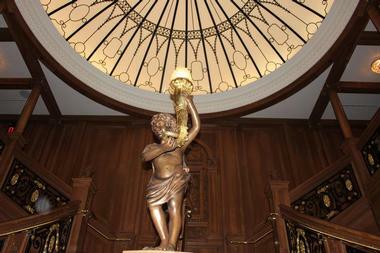 The experience gives visitors the feeling that they are visiting the ship on its maiden voyage in 1912. The Elvis Presley Museum, located on Parkway in Walden’s Landing behind Fire House Golf in Pigeon Forge, is dedicated to the memory of Elvis Presley, and it features numerous exhibits and hundreds of artifacts. The museum displays clothes, memorabilia, movie props, personal items, photographs, and much more. One of the most popular tours in Pigeon Forge is the audio tour of the museum, which is hosted by Ed Hill and Donnie Sumner, both friends and colleagues of Elvis Presley. These hosts’ comments and memories add to the experience as visitors tour the museum and see all of the objects on display in the exhibits. 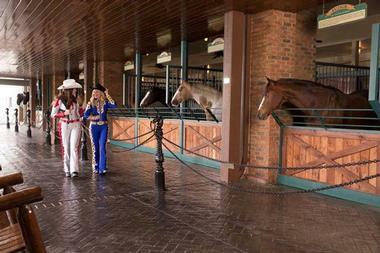 Dolly Parton’s Dixie Stampede Dinner Attraction is a dinner theater located on Parkway in Pigeon Forge, one of two locations. The other is located in Branson, MO. Founded in 1988 near the entrance to Dollywood, the show begins in the Carriage Room with a performance of bluegrass and country music by a live band called Mountain Ruckus. After, visitors are led to the arena where the dinner and show take place. The food consists of freshly made chicken, pork, corn on the cob, potatoes, soup, biscuits, apple turnovers, and beverages. The show is a Wild West revue that consists of large number cast members, more than 30 horses, and a variety of other animals. Located on Mill Creek Road, the Smoky Mountain Ziplines and Canopy Tours is an adventure park that features multiple zip line tours for beginners as well as an advanced level zip line for experienced riders. Tours for beginners include instruction from two experienced and professional tour guides, and the tours start at slow speeds and lower heights. As the guided tour continues, the pace quickens and the lines become higher. There is a large building on site that is available for parties and celebrations after the zip line tour. The advanced tour consists of four side-by-side zip lines that are 800 feet long and 100 feet high. 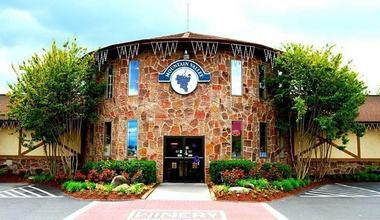 Located on Parkway, the Mountain Valley Winery specializes in producing French and German style wines as well as sweet fruit wines such as muscadine. Founded in 1991, the winery is set in the heart of the beloved Smoky Mountain region in Tennessee. Some of the wines produced include dry wines such as cabernet sauvignon, chardonnay, and merlot, semi sweet wines like Mountain Valley White and Mountain Valley Blush, and sweet wines such as Blackberry, Collier Reserve, Mountain Valley Red, Pink, Rhubarb, Winterfest Red, and more. The winery also sponsors special events, a wine club, and a wine trail. Guided tours are conducted every day and free wine tastings are available. 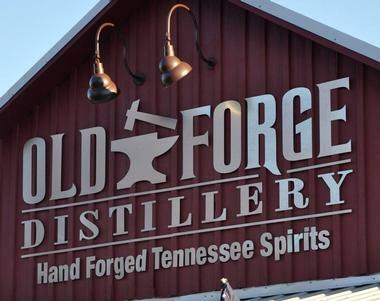 The Old Forge Distillery, located in a historic barn near The Old Mill, is a unique small-batch distillery where Head Distiller Keener Shanton creates moonshines inspired by recipes from The Old Mill Kitchens. Try the innovative Tennessee Roots line and visit the Gift Store which features handcrafted moonshine jugs, locally forged knives and other unique items. Alcatraz East is a fascinating crime museum in Pigeon Forge that explores different aspects of American crime history. The museum includes a number of artifacts from Alcatraz but is not exclusively dedicated to Alcatraz. The museum has more than 500 artifacts in 28 distinct areas within the five galleries called History of Crime, The Consequence of Crime, Crime Scene Investigation, Pop Culture, and Crime Fighting. The museum was inspired by the original, similar museum in Washington, D.C., which was closed in 2015. Of all the interesting exhibits, visitors are most fascinated by the white Ford Bronco, which was driven by O.J. Simpson during the famous car chase.